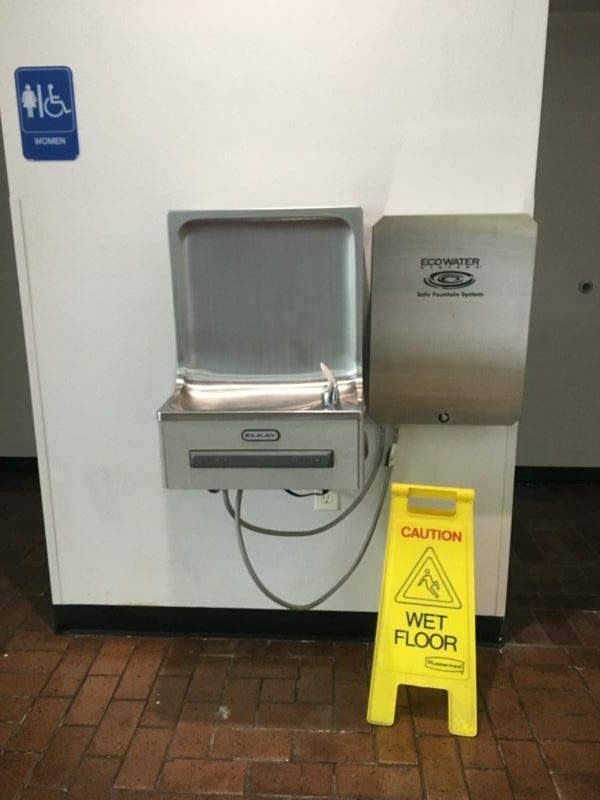 A Lens reporter spotted an EcoWater filter at Orleans Parish School Board headquarters on Aug. 21, 2018. The filters are long-awaited after the district promised to test for lead in water in 2016. The Orleans Parish school district will start installing filters to screen lead from school drinking water on Friday, a district spokeswoman confirmed. The move comes more than two years after school officials first announced a plan to address potential lead in school drinking water and a year since they told school leaders that filters would be installed. In an email, spokeswoman Dominique Ellis wrote that the district’s contractor EcoWater Systems will start installing the filters at school drinking fountains at every district-owned building. After that, the school district “will begin a plan to install kitchen filters,” Ellis wrote. Initially, the plan was to install the filters last fall. But the contract was delayed. This month, children returned to school without the promised filters. On Tuesday, a Lens reporter spotted one in the district’s headquarters. No one knows whether New Orleans schools have high lead levels in their water systems. Orleans Parish schools tested for lead in drinking fountains in 1989, shortly after the federal Lead Contamination Control Act became law. But it’s not clear if they’ve been tested since. Children are especially susceptible to lead poisoning. Experts say there is no safe level of lead for children. Two years ago, as Michigan officials were indicted for the city of Flint’s lead-in-water crisis, the Orleans Parish School Board and Recovery School District announced they would test school water for lead. Instead, after input from experts and concerns that the Sewerage and Water Board of New Orleans could dispute the districts’ test results, the districts decided to install filters. Experts said that would be the safest solution for the city’s schools. Even if schools had been tested, their lead levels could fluctuate. Water line replacement and street construction can disturb lead pipes and release the neurotoxin into water. The Sewerage and Water Board has been criticized for failing to alert citizens of construction work that could pose that risk. The district’s bidding process for filters began last year, but it’s taken until this month to finalize a contract. Last year, the district said it would test school water for lead after the filters were installed. In October, the school board allotted $800,000 to install the filters in all district-owned buildings. Charter schools that own their own campuses or rent facilities can opt-in to the contract and pay to have the filters installed, too. The filters will also protect against harmful microbes, which are a concern when the city falls under a boil water advisory. Those advisories have caused schools to cancel class. It’s unclear which schools will receive the filters first. The Lens has asked the district for an installation schedule, but officials did not immediately respond.